As the athlete falls or slides on the ground, friction causes layers of skin to rub off. In more than 50% of cases the basement membrane is left intact and therefore maintaining the skin’s capacity to heal by itself. These mild abrasions do not scar or bleed. Abrasions are more serious when the dermis is affected over most of the lesion, these will result in the formation of scar tissue. Complete epithelialisation of the lesion, usually achieved within three weeks, may take longer if a larger area of the dermis is affected and also in case of infection. The abrasion should be cleaned and any debris removed. If necessary a topical anti-bacterial agent should be applied to prevent infection and to keep the wound moist. 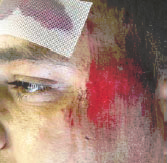 A non-adherent dressing such as a TLC dressing may be applied in order to promote epithelialisation in a moist environment and avoid painful and traumatic dressing changes. If the abrasion is painful, and for large abrasions systemic analgesics may be necessary. Avoid exposing abraded skin to the sun as permanent hyperpigmentation (darkening) can develop. Wear the correct protection when taking part in sporting activities. Wearing gloves, keeping arms and legs, especially the elbows and knees covered will help prevent deep abrasions in the case of a fall when cycling, skating, horse riding etc. Make sure that tetanus injections are up to date.